You Carve the Turkey, Let Us Carve the Hair! Everyone has their own unique way of carving a turkey for Thanksgiving, just like everyone has their own unique way of of cutting, or should we say carving their hair. Have you heard of hair carving or hair tattoos? Hair carving is when you add a little extra to your haircut by getting a design shaved, or carved, into the sides, or depending on the style, your entire head. 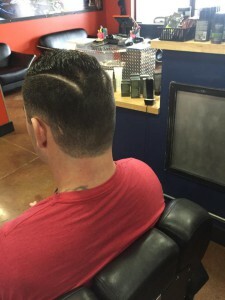 There are endless designs that your men’s hair stylist can incorporate into your favorite cut. Looking for a hair carving idea for the holiday? How about showing your team spirit with a Detroit Lions logo carved into the side of your head. Maybe you just want to show your love for football in general and get the stitching of a football or the goal post incorporated into your men’s haircut. Like we mentioned before there are endless options when it comes to carving your hair into your very own unique look for both men and boys. Check out some of our favorite hair carving designs on Pinterest. See something you like? Bring us a photo and we will incorporate the design into your haircut. Do you already have a design carved into your hairstyle? We would love to see your photos. Like us on Facebook and share your photo!